LAFAYETTE, Ind. — The Lafayette Police Department responded to a report of a bank robbery at the Bank of Indiana on Executive Drive on the city’s east side (across from Caterpillar on SR26). According to a statement released by the police department, the suspect entered the bank and presented a note stating this was a robbery and then fled the bank on foot with an undisclosed amount of money. 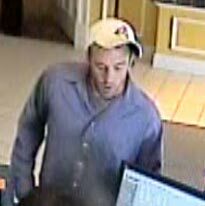 The suspect description is a white male, mid 20’s, 150-180 lbs, approximately 5’8”-6’ feet tall. Security cameras caught the man on tape and show the suspect wearing a blue long sleeved dress shirt, a white cap, blue jeans and white tennis shoes. The suspect fled the bank on foot to the east. No weapon was displayed and there were no injuries. Anyone with information should contact the Lafayette Police Department detective section at 765-807-1250 or the WeTip hotline at 1-800-782-7463.